First time ever on a charter fishing boat and it was awesome. The Smarter Website team was treated to a most awesome day charter by Steve and his boat crew. 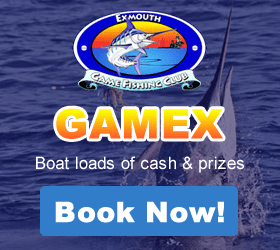 I have never been out at sea for a day or fished prior to coming up to Exmouth in April. The entire day was just fantastic! Setting out into the wide blue wonder was just gorgeous. The Blue Horizon crew were most proficient and fun to hang with for the day. Once we had arrived at a fishing spot we were given the run down on what to do and off we went lowering our lines right down to the bottom. The excitement of getting nibbles and then trying to super quickly wind up the line was just great. And then we had sharks trying to get our fish, that in itself was just unreal. Each and every one of us managed to catch something of splendour. And you have never tasted such awesome fish as this … Spanish Mackeral, Red Emporer, Coral Trout, Tuna, Spangled Emperor to name some of the fish we caught. A highlight for the team was seeing Max the 14 year old deckhand wrestle with a shark that had grabbed our catch. He managed to pull the partially shark eaten fish from its mouth. What an amazing sigh that was. The team on the Blue Horizon supply all the equipment and clean, fillet and bag all the catch for us to take home. We had a ton of fish to take home at the end of the day and oh what a feast we have had. Nothing beats fish caught fresh from the sea! 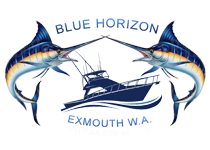 An absolutely top day and I would recommend hooking up with Blue Horizon charters for your next sea adventure. Spring has arrived and the days are getting longer and warmer! The Blue Horizon Charters team have had a great year on the fish and our six day Monte Bello island trips were a huge success with quotas filled and amazing weather. Twenty metres in length and 5 metres wide the Blue Horizon vessel has enough room for all keen fishermen. 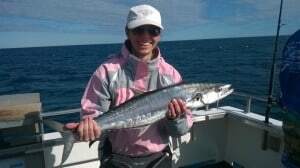 Catering for groups, singles, bucks days, exclusive charters, four day Long Island trips, West Side live a boards, Monte Bello Island Trips, and game fishing tournaments, we can accommodate nearly all types of fishing fanatics! Owner/operator Steve Salmeri also skippers along with his crew, have a massive amount of knowledge and passion to make your day or live aboard one you won’t forget. 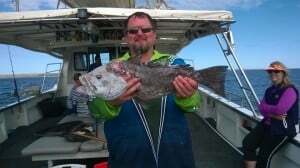 Day trips have been consistent all year with an array of fish caught from Coral Trout and Bluebone, to Rankin cod, Spangled Emperor, Red Emperor and Spanish Mackerel.